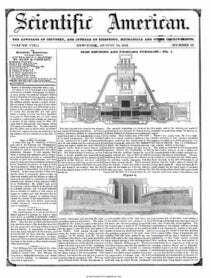 Thomas Durden, of Montgomery, Ala., has taken measures to secure a patent for a new corn crusher, which is exceedingly well adapted for cracking and crushing corn in the ear, aIto various other vegetables. The hopper for the reception of the corn is peculiar; it receives the ears of corn by various small openings ; they pass down and are first cut by a revolving S-shaped knife on a vertical spindle, and after that they pass down and are crushed between grooves and projections on the revolving spindle, and grooves and projections on the inner face of the machine. The grinding parts are of cast-iron, the inside of the case being a hollow cone, its bottom where it discharges being the apex, and the grinding spindle or muller acting with its outer on the inner surface of the case. The apparatus is simple and good.